In honor of one of the most startling minds of the twentieth century, we inaugurated the Hannah Arendt Prize in 2012, with the blessing and support of numerous individuals, including Arendt’s former assistant, Professor Jerome Kohn, former Director of the Hannah Arendt Center at the New School University. Focusing on a contemporary topic we believe Arendt would find of utmost critical importance were she alive today, the annual essay prize in her name is devoted to creative research and a set of core principles and assumptions at the heart of the arts and new humanities, including sense-based intelligence; the reality of singular, nonrepeatable phenomena; ethical vision; and consilience between inner and outer, nature and reason, thought and experience, subject and object, self and world. The first competition was devoted to the theme “The Visible, the Invisible, and the Indivisible,” while the second competition concerned the question of the intervention. The 2012 and 2013 competitions were held through the Pacific Northwest College of Art, with all subsequent competitions sponsored exclusively by the Oregon Institute for Creative Research. The competition is open to the public, with winners selected by a distinguished international jury. San Francisco-based writer Rob Marks won the 2013 Hannah Arendt Prize for his essay “The Site of Imaginative Contention,” with judges citing his direct, unblinking address of the theme of “The Visible, the Invisible, and the Indivisible.” The prize carried a $2,000 cash award and was funded by the Colville Foundation. The runner-up was Madeline Avram Blount for her essay on the political asymmetry of visibility and invisibility. Robert Spencer Coldren was awarded third place for his essay “Visibility,” which interrogated the prompt itself. The second year’s prize addressed the theme of “On Art and Disobedience; Or, What Is an Intervention?” The competition drew 255 entries from 34 countries around the globe, including Australia, Austria, Belgium, Bhutan, Bosnia and Herzegovina, Brazil, Canada, China, Denmark, England, Finland, France, Germany, Greece, Ireland, Israel, Italy, Japan, Mexico, The Netherlands, New Zealand, Norway, Poland, Portugal, Romania, Russia, Scotland, Serbia, Slovakia, Spain, Switzerland, Taiwan, Venezuela, and the United States. The judges awarded first place to Stéphanie Bertrand of Thessaloniki, Greece, and Nate Harrison of Brooklyn, New York, for their essays “Dropouts” and “Immanence of Intervention, Revival of Critique,” respectively. Bertrand was cited by the judges for her nail-on-the-head exemplification argument that art operates increasingly as a form of intervention, more specifically, as immunity. “As both a real and symbolic space,” writes Bertrand, “the art world creates an opening where transgressive artistic interventions register publicly as acts of disobedience while eschewing, for the most part, the threat of lawful punishment.” More cautionary, Harrison addresses the problem of the growing abyss between operationalism and expression, warning against the squandering of our capacity of critique amid capitalism’s capacity to redeploy interventions in form alone: “It is by recognizing intervention as not only an expressive but also an operational gesture that we revive critique, and enter into what Sonia Katyal terms ‘semiotic disobedience,’ an occupation of both representations and their vectors.” Bertrand and Harrison will share the prize and the $5,000 cash award. Second place was awarded to Marc Lombardo for his essay “On Power, Truth, and Living Statues.” Without once mentioning the word intervention, the piece makes a simple and powerful point at a time when frenzied activity is often taken as a sign in and of itself of political significance and efficacy. Third place went to Arnaud Gerspacher for “Interventions.” Avoiding cynicism, the essay “addresses the idea of the joyous intervention and the necessity to engage a certain theological residue in the form of grace: that is one way to think about a felicitous intervention—one that moves people or shifts the ground,” in the words of one of the judges. Singled out for Special Mention was S. L. Irani-Silberman’s “Interrupting Invisibilities and Bridging Worlds: An Essay on the Work of turkopticon.differenceengines.com,” with the judges citing Turkopticon as a powerful digital intervention. The work was cited in Salon, Financial Times, and Huffington Post, among others. Thought, finally—which we, following the premodern as well as the modern tradition, omitted from our reconsideration of the vita activa—is still possible, and no doubt actual, wherever men live under the conditions of political freedom. Unfortunately, and contrary to what is currently assumed about the proverbial ivory-tower independence of thinkers, no other human capacity is so vulnerable, and it is in fact far easier to act under conditions of tyranny than it is to think. As a living experience, thought has always been assumed, perhaps wrongly, to be known only to the few. It may not be presumptuous to believe that these few have not become fewer in our time. This may be irrelevant, or of restricted relevance, for the future of the world; it is not irrelevant for the future of man. The temptation of cynicism is strong and compelling in dark times, if sometimes subtly encoded; and it is worth remarking that many of the submissions to the Hannah Arendt Prize recognize this danger even as they suggest that the future can no longer be taken as a given. The ramifications of such a situation for human life, thought, and freedom, have yet to be fully understood or even adequately registered. In light of Fukushima and genetic engineering, the future itself may require an intervention. 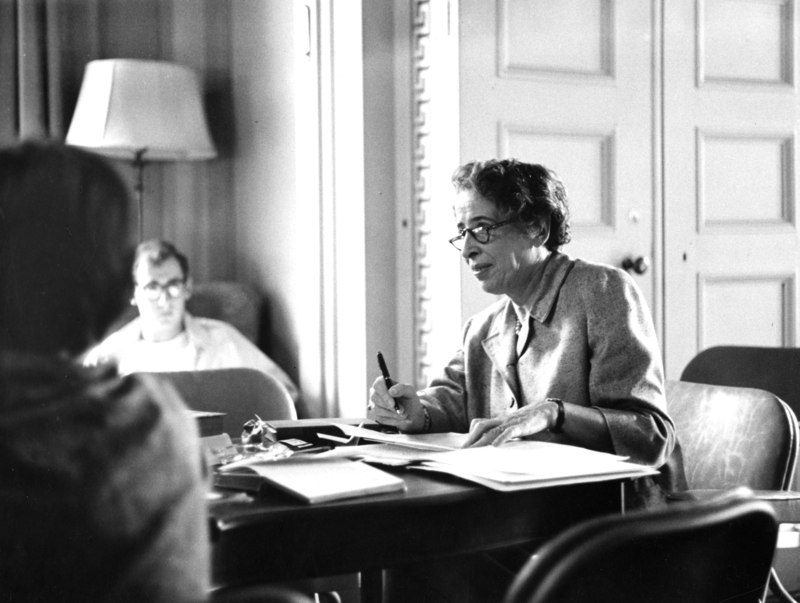 We are proud to sponsor a prize in which the life, work, and legacy of Hannah Arendt live on. The next competition will focus on the theme of the Animal.